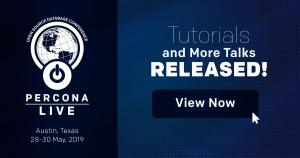 Tutorials and initial sessions are set for the Percona Live Open Source Database Conference 2019, to be held May 28-30 at the Hyatt Regency in Austin, Texas! Percona Live 2019 is the premier open source database conference event for users of MySQL®, MariaDB®, MongoDB®, and PostgreSQL. It will feature 13 tracks presented over two days, plus a day of hands-on tutorials. Register now to enjoy our best Super Saver Registration rates which end March 17, 2019 at 11:30 p.m. PST. Here is one item from each of our 13 tracks, samples from our full conference schedule. Note too that many more great talks will be announced soon! MySQL®: The MySQL Query Optimizer Explained Through Optimizer Trace by Øystein Grøvlen of Alibaba Cloud. MariaDB®: MariaDB Security Features and Best Practices by Robert Bindar of MariaDB Foundation. Percona Live 2019 will be held at the downtown Hyatt Regency Austin Texas. Located on the shores of Lady Bird Lake, it’s near water sports like kayaking, canoeing, stand-up paddling, and rowing. There are many food and historical sites nearby, such as the Texas Capitol, the LBJ Library, and Barton Springs Pool. Book here for Percona’s conference room rate. Sponsors of Percona Live 2019 can interact with DBAs, sysadmins, developers, CTOs, CEOs, business managers, technology evangelists, solution vendors, and entrepreneurs who typically attend Percona Live. Download our prospectus for more information.